The Victoria Mission seeks to meet the physical and spiritual needs amongst the homeless people in Victoria. Victoria in central London is famously know for Victoria train station – the central hub for major transport links serving commuters to and from Southen England. On deeper inspection, you will also find it’s a place where foreign nationals and homeless people congregate. They have been living it rough on the streets and are from broken homes and families. Many are from Eastern Europe and English is their second language. They have been marginalised and disowned by society. They have drug and alcohol problems. Some suffer from severe mental health problems. The Victoria Mission was founded in 2010 by Jospeh Yun when the Lord called him to start a ministry that would meet the physical and spiritual needs amongst the homeless people in Victoria. We have been meeting every Sunday ever since. 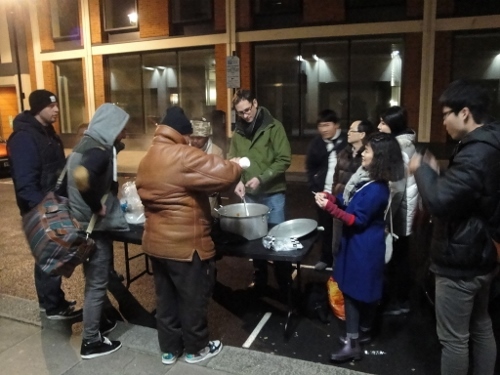 We provide for their immediate physical needs by serving hot homemade food at 7pm at Howick Place, where about 40-50 people gather. But that is just the start! For in John’s gospel, Jeuss said, “I am the bread of life. Whoever comes to me will never go hungry and whoever believes in me will never be thirsty” (John 6:35). So we move to the Emmanuel Centre on Marsham Street at 8pm for a 45 minute church service. This will consist of a time of prayer, singing, interviews, a bible reading, a 15 minute bible talk followed by a 10 minute discussion in small groups in response to the passage. About 30-35 people regularly attend with new people coming every week. After the service, there is time for coffee, cake and fellowship where we have a chance to chat personally together and to distribute bibles and gospel tracts in their native languages. We also distribute warm clothing, shoes and sleeping bags. The Victoria Mission team, led by Rick Raja, would appreciate the help of volunteers from the congregations of Co-Mission and their friends and family. Here are 5 ways in which you can serve: Pray, Donate, Cook, Invite, Come. 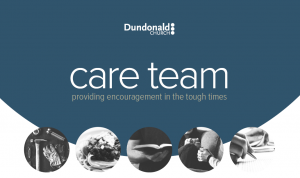 Please pray God would continue to sustain this ministry and raise up more volunteer leaders to join the team; for faithful proclamation of God’s word each week. Pray that more and more people would hear the good news of the saving work of Christ Jesus and come to faith in him. Please donate clothes, sleeping bags, shoes (particualrly large sizes for men) and bibles (especially in Eastern European languages). Please Cook food (hot meals for 40-50 people) and cakes. Please Invite people who you see on your commute to and from work? Invitation fliers should be availble through your church. Please Come up to Victoria with us. There are opportunities to serve across the board. We’d love you to be involved with any aspect of the evening and would greatly appreciate help during the service (with reading, praying, leading, music). Please contact Rick Raja (Team Leader) for more information or to offer to help.